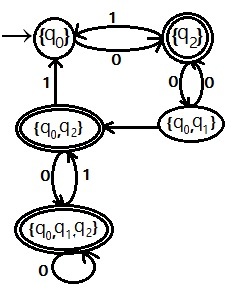 Finite automata include two different classes Deterministic Finite Automata (DFA) and the Non deterministic Finite Automata (NFA). These are converted from one to another i.e. Non Deterministic Finite Automata to Deterministic Finite Automata (NFA toDFA) conversion and Deterministic Finite Automata to Non Deterministic Finite Automata (DFA to NFA) conversion. Some more enhancement of NFA machine is NFA with ε moves i.e. (ε-NFA) can be convert into DFA and vice versa. A DFA is directly converted into Regular expression. Below diagram explain about all conversions of Finite Automata conversion. 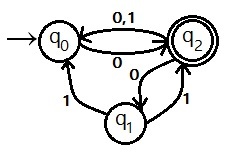 The goal is to construct a Deterministic Finite Automata (DFA) from given Non-Deterministic Finite Automata (DFA) machine which is much faster in recognition an input string. The main idea behind this conversion to construct a DFA machine in which each state will corresponds to a set of NFA states. The worst case complexity of NFA to DFA conversion is O(2N) of sets of states. The DFA can have exponentially many more states than the NFA in rare cases. Construct a transition table TransactionD. Each DFA state is a set of NFA states. TransactionD simulates in parallel all possible moves N can make on a given string. Set of states reachable from state S via epsilon. Set of states reachable from any state in set T via epsilon. Set of states to which there is an NFA transition from states in T on a symbol a.
initially, ε-Closure (S0) in TransactionD. Following algorithm shows a computation of ε -Closure function. Push all states in T onto stack. Construct the transaction table of given NFA machine. Scan the next states column in the transaction table from initial state to final state. If any of the next state consists more than one state on the single input alphabet. Then merge them and make it new state. Place this new constructed state in DFA transaction table as present state. The next state of this new constructed state on input alphabet will be the summation of each next state which parts in the NFA transaction table. Repeat step 2 to step 4 until all the states in NFA transaction table will be scanned completely. The finial transaction table must have single next state at single input alphabet. Construct the equivalent DFA of the NFA given in figure (1). how to convert a c language program into tokens using lex tool. Please do this practically.